Queen duvet cover (88" x 88") featuring the image "Dahl Dolphin" by Phyllis Taylor. Our soft microfiber duvet covers are hand sewn and include a hidden zipper for easy washing and assembly. Your selected image is printed on the top surface with a soft white surface underneath. All duvet covers are machine washable with cold water and a mild detergent. And what you didn't mention, Phyllis, is that they're incredibly fast and hard to get a shot of! Congratulations on your timing! Lovely! They are so fast! 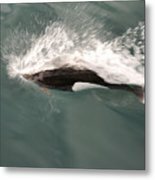 This Dahl Dolphin was racing our boat as we cruised in Prince William Sound in Alaska. 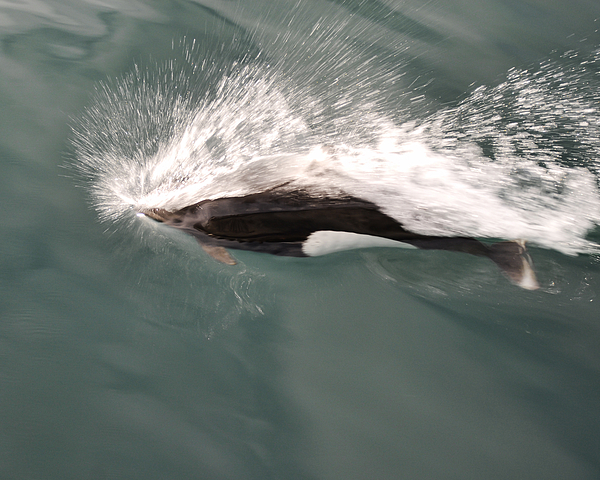 The unique body shape of Dall's porpoise makes it easily distinguishable from other cetacean species. The animal has a very thick body and a small head. The colouration is rather like that of a killer whale; the main body of the porpoise is very dark grey to black, with very demarcated white patches on the flank and belly. The dorsal fin is set just back from the middle of the back and sits up erect. 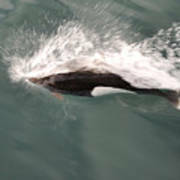 The upper part of the dorsal fin has a white to light grey "frosting".